I didn’t even realize the crescent moon was setting in the west until after I took this last shot of sunset over Rattlesnake Arch (also called Centennial Arch) before retiring for the evening and starting the long walk back to the campsite. The clouds were amazing, but in the near darkness didn’t even show their trul forms until this conversion into black and white. 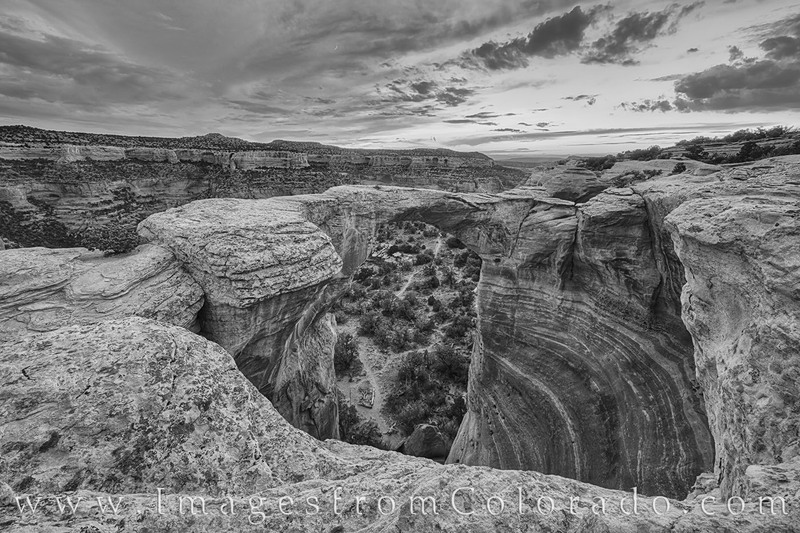 I love the swirls and motion in the shades of gray as they move over this remote part of western Colorado. Though just a stone’s throw from Grand Junction, this canyon, as part of the McInnis Canyons area, is difficult to access. The effort to reach this location, however, is worth it for landscapes such as this. Photo © copyright by Rob Greebon.